Walking is one of the best exercises you can do. Humans were explorers and walked a lot throughout their history. Modern humans tend to sit in cars, in front of computers and watching TV. Get up with your family and friends and walk. Walking each day ensures you can still walk as you age! In Italy you can see people strolling around town after lunch or in the evening as the sun sets. It helps digestion, it brings the family together and its healthy. Everyone does it. It is not only healthy but extremely social. Italians love to see other people and be seen by people. What a great way to meet people in your town. You stroll and stay in touch with each other. You don’t need Facebook to do this in Italy! We typically get up and spend time on our balcony looking at the sea and mountains. Monte Stella is a beautiful cone-shaped mountain that protrudes through the clouds. Some days it is hidden by clouds and others it is right there. Our little town is below us on the hill. A train runs by often taking people from Naples to Sicily and back. Jo Anne takes a hundred pictures of this exquisite beauty. We eventually get ourselves out and drive down to Casal Velino Marina for Breakfast. We have two favorite places: 1) Franco’s and 2) Isola Verde. Isola Verde has free WiFi so we can connect to the world and see what is happening. I order a Cafè (espresso) and Cornetto and Jo Anne orders a Cafè Americano and a piece of Torta (cake) for a few Euros. At Franco’s the selection is more exquisite. 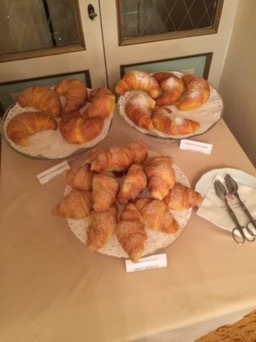 One of our favorite is sfogliatella. As we sit and finish up with the internet, we plan our day. What city will we visit today? We then drive to our destination and start our tour/walk. At lunchtime we look for a small restaurant or a bar. Bars have great sandwiches and you can have a beer or wine. Small restaurants let you order a local dish and local wine. After lunch we are back to touring, walking and climbing steps (lots of steps). We typically walk 5 to 8 miles a day and can climb as many flights of steps as 50. This helps work off lunch and maybe that afternoon gelato we can’t resist. Sometimes we eat dinner locally or we may head back home and eat in one of our favorite local restaurants. Pasta, fish, pizza and other specialties are all prepared fresh and wonderfully. We get to talk with local people and maybe have dinner with friends. Finally we head home to sit on our balcony with a glass of wine and reflect on Italy’s beauty and prepare for another day of the same encantment. We are blessed and lucky to have such a romantic place to call home! Now you are ready for your trip. Where can you find a place to exercise in Italy? Italy does have gyms but you won’t need them. Just walk … walk … walk and climb those stairs. You don’t need machines in a gym. Use the environment of Italy and get your exercising in as you tour. While you walk look around you. Smell the smells of Italy. In piazza with flower shops smell the fresh flowers. At fruit or vegetable markets stop and smell the produce. You can actually smell the fruit and vegetables in Italy. They are so fresh. We are so used to produce that is picked before it is ripe and shipped to us that when we get it, there is nor smell or flavor. 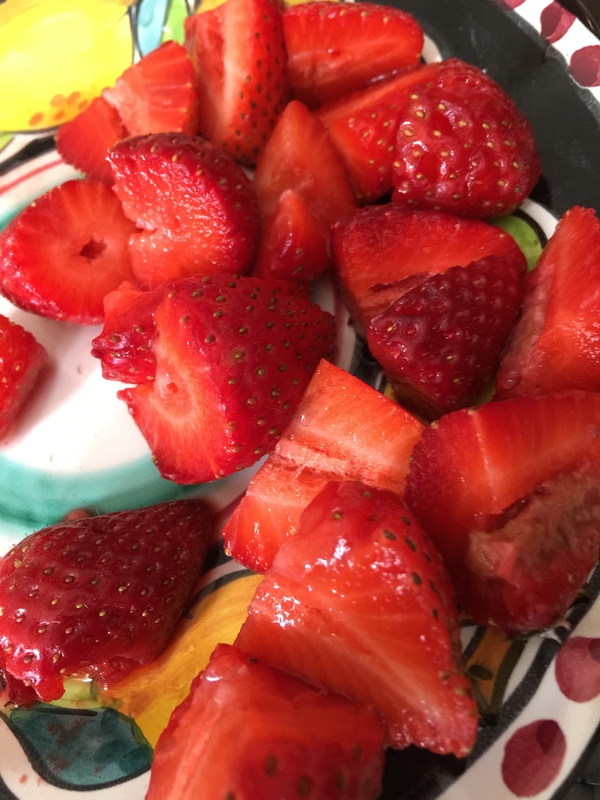 The strawberries are red and juicy inside, not white and dry. The peaches are perfect and juicy nor mealy. Apples smell and taste like apples. The berries are so good you will not believe it. Buy some fruit and snack at a fountain or as you walk. Italy is all around you. Enjoy it to its fullest. The vegetables are so fresh and still have dirt on them. If you have an apartment with a kitchen, buy some and prepare them. This is a real treat. We are vegetarians so we don’t eat meat but we eat some cheese and fish. In southern Italy the fish is so fresh and there is more of it than meat. The cheeses are so aromatic and fresh. Just a little with some of that great Italian bread. So good! Molto Buono! Yes eat some pizza, pasta, gelato and wine. You deserve it. But eat fresh fruit and vegetables as well. 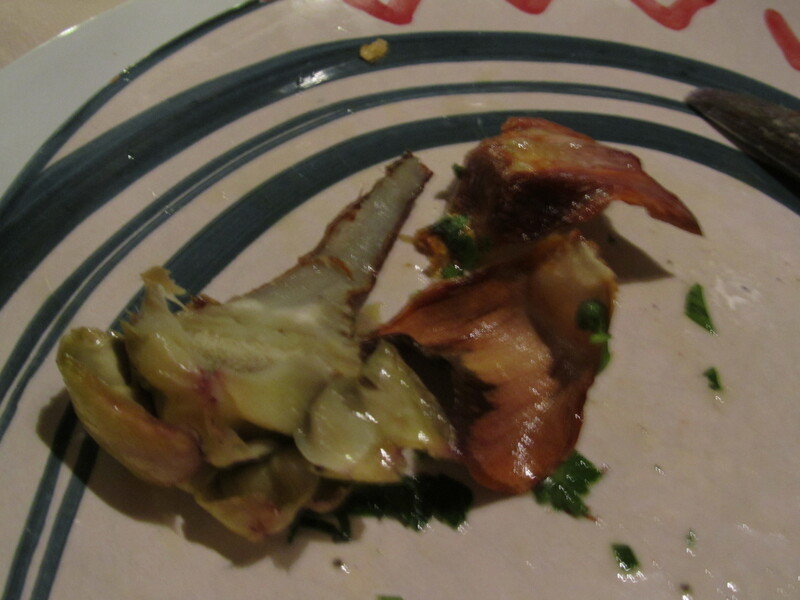 Italians do not usually serve a vegetable with an entrée but you can order them extra. Italian families eat a lot of fruit and vegetables. 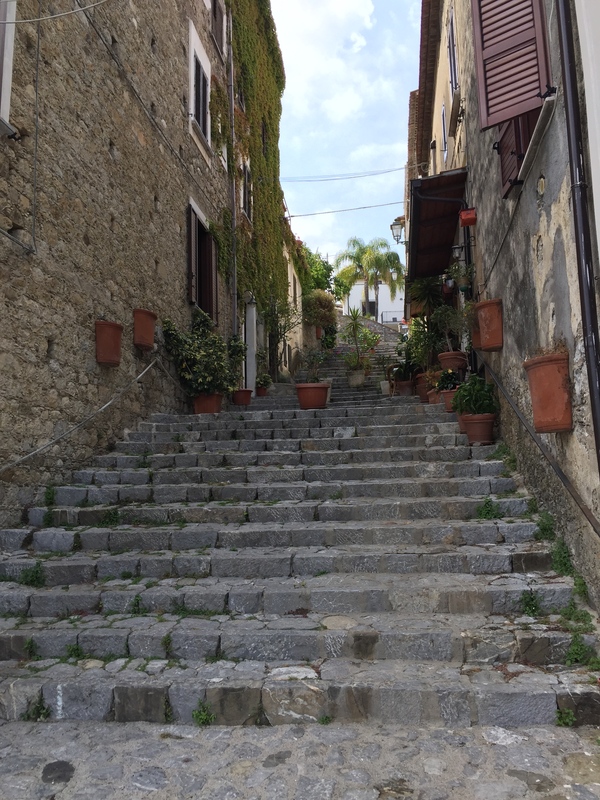 In small towns there are stairs everywhere. Take them. You will develop great looking calf calls and be fit by the end of your vacation. Some of the most interesting places are up or down a large set of stairs. Avoiding them will mean you miss so much. 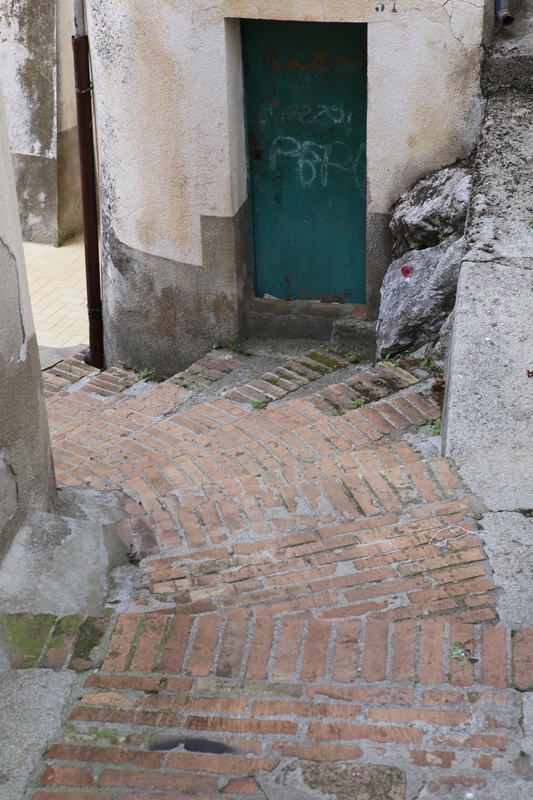 Cities like Positano are ALL Stairs! You really can not avoid them. We walk 6-8 miles a day and sometimes climb 30 or more stairs. By the time you come home, you won’t think twice about walking a few miles or climbing several flights of stairs. 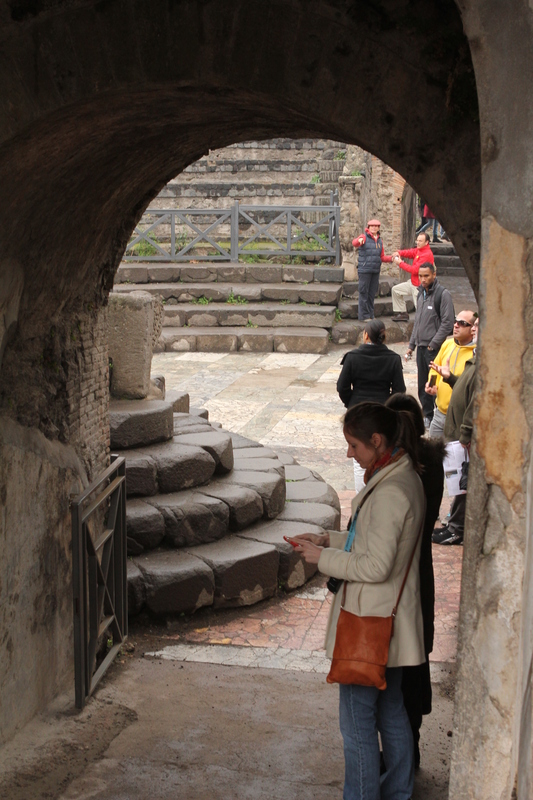 In Rome, walk to everything. The sites are within a few miles of each other. Don’t just take the metro. Walk and see the city! No gym will do that for you. Be healthy, live long, enjoy Italy as the Italians do. So you are traveling to Italy. You will be eating a lot of good food, drinking wine or beer. How can you stop gaining weight? Sure in Italy it is all good, the wine, gelato, pastries, pizza and great Italian food. How do we enjoy all of these and not put on weight? It’s easy! First Italian wheat has no GMOs. GMOs are associated with weight gain. Their food is still pure and fresh. Second you exercise a lot when you travel in Italy, or you should. I am not talking about a gym. You don’t need a gym. Just walk and take the stairs. Hotels – have very small elevators. Use the stairs to your room and to breakfast. 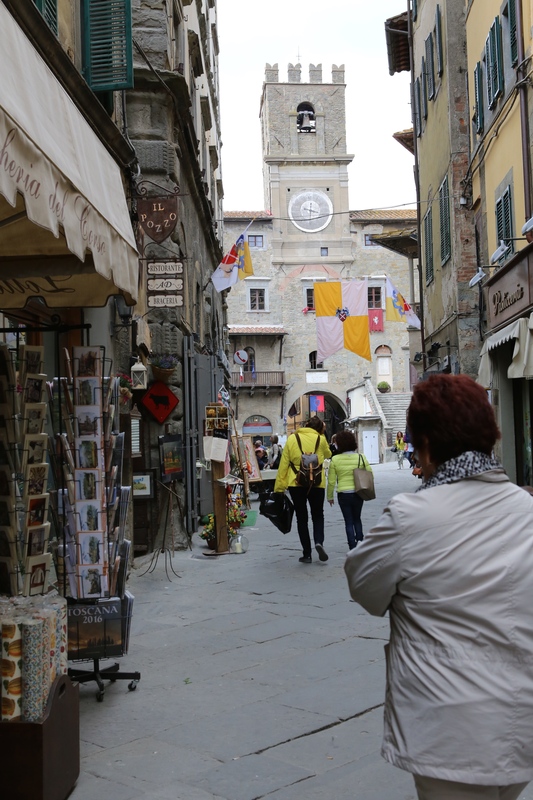 Around Town – Walk to the tourist sites and restaurants you want to visit. There are great Metros (subways) in Italy but most cities have a small old city areas and it can be walked. 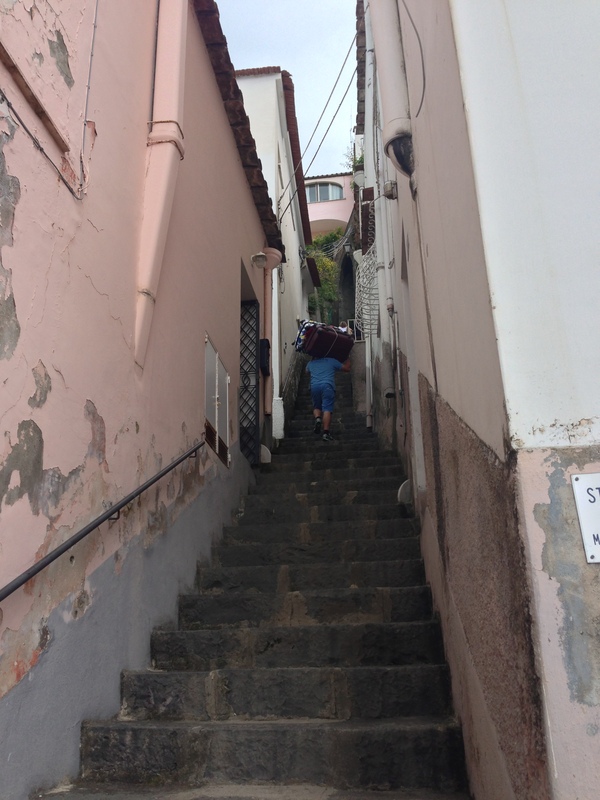 Steep Cities on Mountains – Cities like Positano are full of stairs and a steep road. 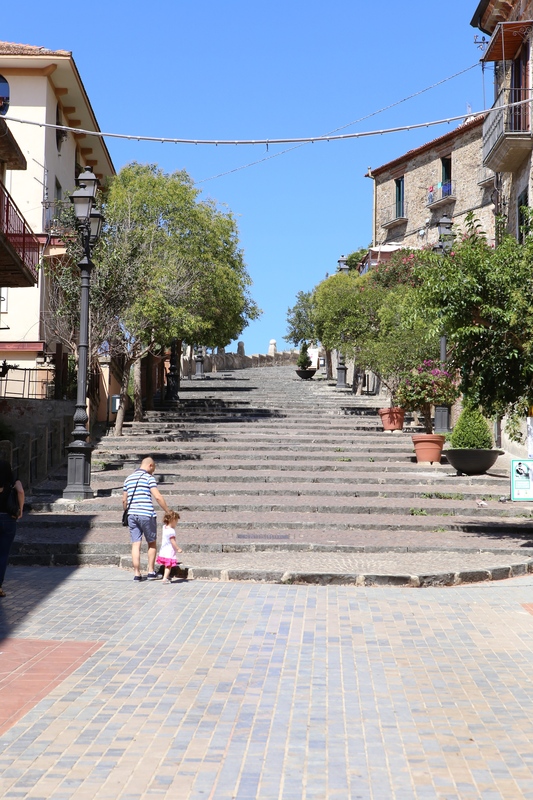 Take stairs and if you tired take the road (it is still exercise since it is so steep). We stayed at a place in Positano that was 104 steps above the nearest road. Monuments – Museums, churches and galleries have steps. Some do have elevators but take the stairs. 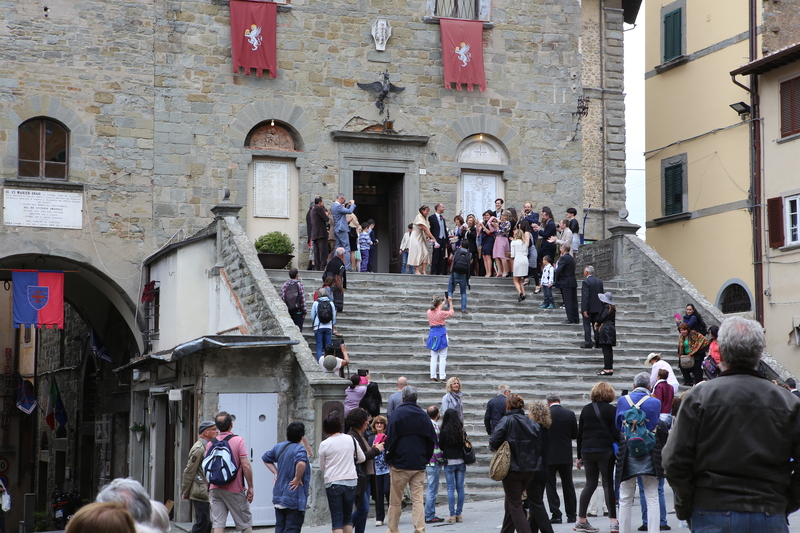 After Lunch Walk – Italians close businesses after lunch so they can be with family and walk together. Enjoy a slow walk around town. Meet people and greet them. You will find you can eat like the Italians and keep a trim waist like them as well. You are in Italy so be Italian!